Have you ever noticed, small numbers printed above certain words or at the end of the sentences as superscript in a document or book. These numbers either match with the numbers placed at the bottom of the respective page representing footnotes or at the end of the book or a document, as endnotes. Footnotes and Endnotes are used by the author for various purposes such as to provide bibliographical information, outside sources, copyright permission, explanatory information, citations or some additional details about the topic under consideration. 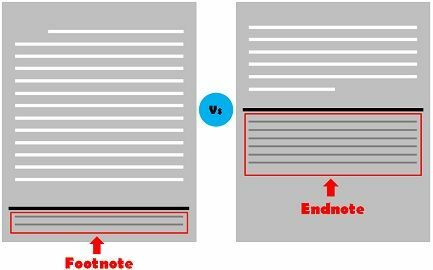 The article excerpt presents you all the important information related to the differences between footnote and endnote. Meaning Footnote refers to the supplemental piece of information, published at the bottom of the page. Endnote implies a note printed at the end of the book or a particular section of the book. Contains An abbreviated addition of an in-text excerpt. Details of the reference quoted. Footnote, as the name signifies, is the note appearing at the bottom of the page, to cite relevant sources, references or provide additional details with respect to the definite portion of the text above it. It is used to simplify or add more detailed information to the text mentioned on that page. Footnote is expressed in the form of a superscripted number or a symbol, just after a word or sentence, whose cross-reference is given at the bottom of the same page. It can be found in books, research papers, reports, documents, articles etc. Endnote can be understood as a note found at the end of the document or the book or a section of the book, containing sources of facts or information and extraneous information on the points used in the text. Endnotes are primarily used to cite the authors and titles of the sources used in the text and arranged in a chronological order concerning the references used. They are denoted by numbers or sometimes symbols such as an asterisk (*). These are found in books, research papers, articles, essays etc. A footnote can be described as a note shown at the bottom of the page that gives extraneous information to the reader and refers to a particular part of the text. On the contrary, endnote is used by the author to give credit or reference to the text, appearing at the end of the essay or book. Footnotes appear in the footer of the page. As opposed, endnotes appear at the end of the document, book or the section of the book. While footnote is nothing but an abridged extension of an in-text excerpt. Conversely, endnote is mainly used by the author to quote references or provide information about the external sources. Footnotes and Endnotes are an important part of the text, because, if an author uses an information which is necessary for the reader, although, not the main part of the text, in the middle of the text or page, then reading might get tedious. That is why, these notes are of utmost importance, as they help the author to provide relevant information without disrupting reading. Both contain a note referring number or symbol, in the text to represent that extraneous information is provided in the footnote or endnote, however, the author uses the different numbering system for the two, so as to help readers in referring to the appropriate note for the information. Moreover, a short horizontal line can be seen just above the note, to separate it from the main body of text. The font size of the footnote or endnote is comparatively shorter than that of the main text.